As summer approached, the early mornings have become lighter, and I was almost ready to put on my sunglasses by the time I reached Inspiration Point. It was also super warm! Normally, I stay bundled up for the first descent down Wildcat Canyon to the other side of the ridge. But by the time I reached the top, I was stripped down to my jersey, and it was pretty comfortable to roll downhill without a wind shell. This definitely made me wonder what the conditions farther inland would be like later in the morning. Danish, coffee, and sunscreen to keep me going. The next stretch brought me back through the neighborhoods where I got lost on the group ride I did in March, but this time I figured out the way through. 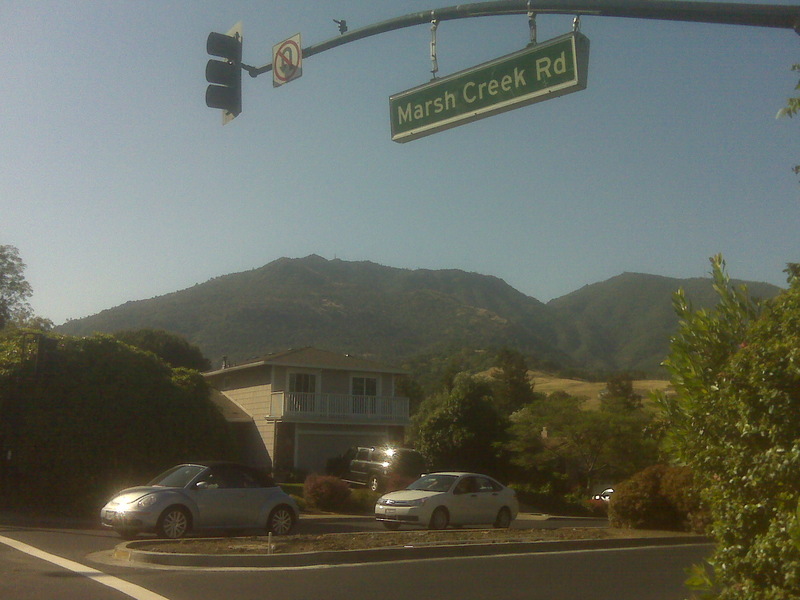 After about two hours I was in Walnut Creek, a place that feels so far away – in terms of geography, lifestyle, weather, etc – but is actually only about 20 miles. I had run out of sunscreen the previous weekend so I stopped for a latte break and also purchased some sunscreen at the first shopping plaza I encountered on the outskirts of town. rterial, that thankfully wasn’t super busy between 8:00-9:00 a.m. on a Saturday morning. Towards the end of Urban Slog Part 1, I intersected with a group of folks training for the AIDS LifeCycle who were headed the same direction and chatted with the ride leader climbing up a solid hill. She was riding the previous years’ version of my bike and I tried not to be too sad – I had that bike for about eight months, before it was lifted in our second burglary, and I liked it better than the newer version I ended up with as a replacement. Sigh. Finally, I reached the community of Clayton and turned off the horrible “boulevard” into a cute historic downtown that was being set up for the annual Clayton Art & Wine Festival. It didn’t start until 10:00 a.m. so I continued on through, heading back out into one of the most remote parts of the Bay Area along Marsh Creek Road. By now it was pretty warm, and I was glad I had slathered up with sunscreen earlier. Marsh Creek Road soon brought me to Morgan Territory Road. I turned right and started gradually heading up hill. Within a few miles, the road narrowed to one lane and the creek started to drop away below, with glimpses of golden hills dotted with oaks peaking out through the trees. View from my emergency Clif Shot stopping point. Because my coffee stop had been a little earlier than usual, I felt like I was a bit behind. At 9:30 a.m., I decided to postpone my sandwich break until the top of the next rise. Which. Never. Came. I hadn’t realized that I was on a very long ascent; every time I saw a suitable rest stop, I also saw the ridiculous next stretch of uphill, and I didn’t find that relaxing enough for my break. So by 10:15 a.m. I was close to bonking and moving reeeeeally slow. I stopped at a random spot and sucked down a packet of energy gel, which I always have along for emergencies but never use. This was merely an emergency of stubbornness (I wanted a nice place to eat my PB&J and sit down!) but it did the trick. 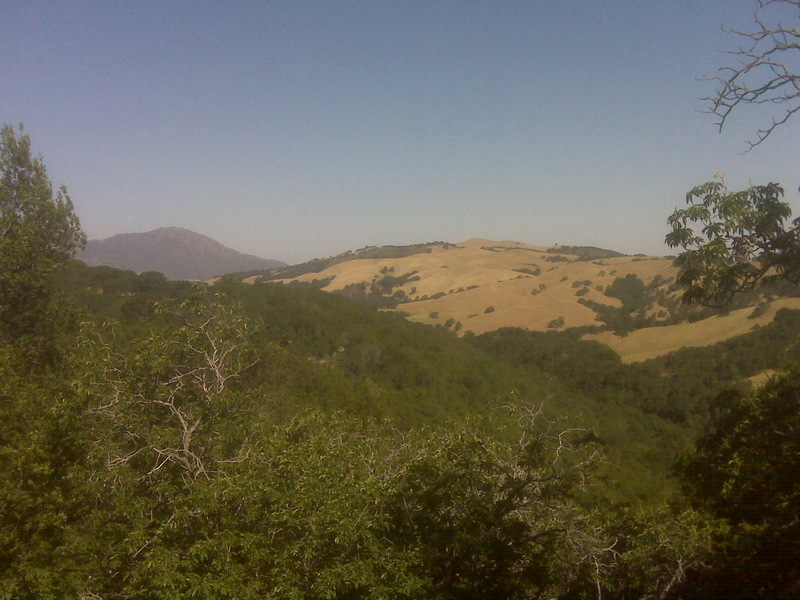 Soon I reached the top, and the official visitor parking lot for the Morgan Territory Regional Preserve. A nice shady spot under an oak tree welcomed my now-weary legs. I gobbled down my sandwich, supplemented my water supply with a hit from the fountain, and used the recently-cleaned facilities. It felt nice to refresh before moving on. And then I started down, down, down one of the biggest, widest descents I’ve ever experienced. The San Ramon Valley spread before me as I clung to the winding ribbon of road that curved its way steeply down the mountain. I tried not to clutch the breaks too much, but I wanted to control my speed on an unfamiliar road – and also enjoy the view! This is the view from where I was when I hit my fundraising goal! About halfway down, my phone buzzed again. Normally I wouldn’t stop to check my phone at a moment like this, but I had been contemplating taking a photo…and I was so curious if it was another donation. So I pulled over and there learned that my friend Kristie had made the gift that put me over $5,000. Woooohooo! A double triumph on this incredible ride. At the bottom of Morgan Territory Road I realized I was just off the edge of my map, and not sure which way to turn. After a few minutes of standing at the intersection looking puzzled, a driver stopped and helped me figure out that I probably wanted to go right. 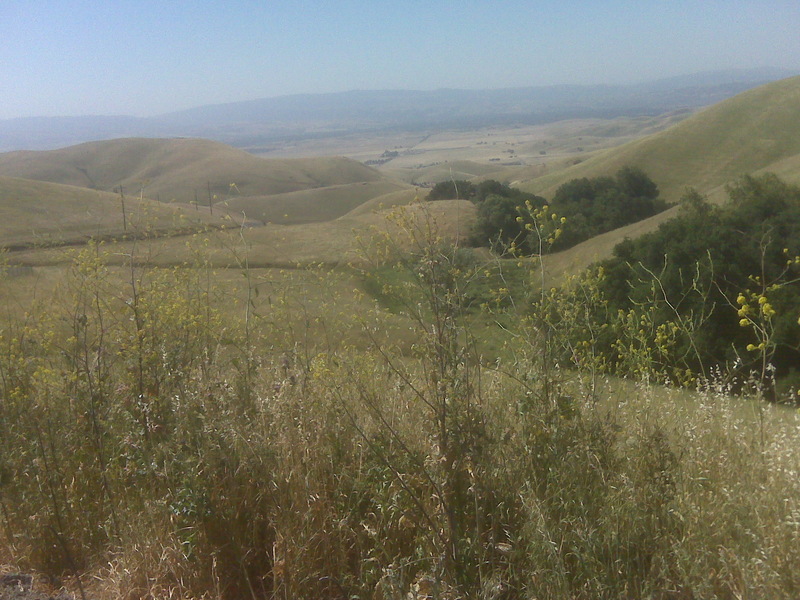 I headed slightly away from my final destination – Dublin/Pleasanton BART – in order to stay on back roads, and began pedaling along rolling terrain between farms and pastures. The rest of the ride was a bit of survival, and ultimately not entirely scenic. I was pretty tired after all that climbing. And then I got to Dublin where the back side of an enormous Target parking lot was the first thing I encountered. I’ve seen this stretch of suburban malls from the 580 many times, but on my bicycle it took a long time to roll past it to the BART station. Even with bike lanes, Urban Slog Part 2 was probably my least favorite part of the ride. Just before noon, I reached the BART station and the bike computer read 64.49. I would tack on another three miles or so from West Oakland BART to home (too impatient to wait 14 minutes to change trains and go to a closer station). That afternoon we got back on wheels to help a friend move and I was still pretty slow, but thankfully Peter hauled A on the cargo bike. The next day, my 20-mile follow up ride continued to be slow. I think I hit my limit for right now. Peak training complete. One more weekend of training, and then the real thing!